Cuban officials announced Tuesday night that they have detected the first case of the Zika virus transmitted inside the country, ending Cuba's status as one of the last nations in the hemisphere without domestic cases of the disease that has been linked to birth defects. State media said a 21-year-old Havana woman who had not traveled outside Cuba was diagnosed with the virus after suffering headaches, fatigue and other symptoms. On Monday, her blood tested positive for Zika. She remains hospitalized. Cuba had previously reported a handful of cases of the disease in people who had traveled to countries with outbreaks of the mosquito-borne virus, particularly Venezuela, and appeared to have contracted it there. Cuba has close ties to Venezuela, a fellow socialist country that sends hundreds of millions of dollars a year in subsidized oil in exchange for Cuban medical assistance that sees many thousands of people travel between the two countries annually. Zika is being investigated as a possible agent in cases of microcephaly, a condition in which babies are born with unusually small heads and brain damage, and also in cases of Guillain-Barre, a rare condition that sometimes results in temporary paralysis. 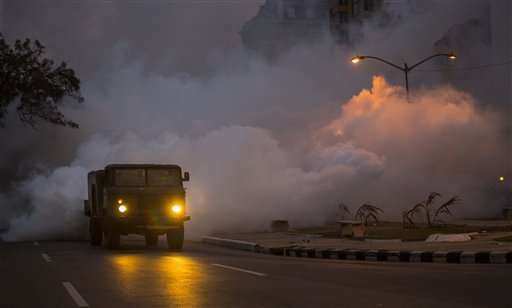 Cuba has thrown more than 9,000 soldiers, police and university students into an effort to fumigate for mosquitoes, wipe out the standing water where they breed and prevent a Zika epidemic. President Raul Castro has called on the nation to battle lax fumigation and trash collection, turning the Zika fight into a test of the communist government's once-legendary ability to marshal the entire country behind efforts ranging from civil defense to bigger sugar harvests to disease prevention. 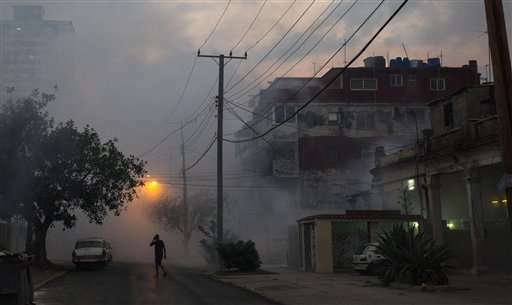 In recent days the streets of Havana have been crisscrossed by teams of green-clad soldiers fumigating houses with mosquito-killing fog. Residents of the capital say fumigators no longer accept excuses of allergies or requests to spray some other day, as frequently happened in the past. Still, neighborhoods like Central Havana, where the patient in Tuesday's case lives, are filled with decaying buildings, piles of uncollected trash and pools of standing water. The Zika announcement comes at a moment of intense international attention on Cuba: President Barack Obama arrives on Sunday as the first sitting U.S. president to visit in nearly 90 years. The Obama administration on Tuesday announced that it was carving a series of broad new exceptions into the U.S. trade embargo on Cuba, removing limits on individual travel that experts predicted would lead to a boom in U.S. visitors.